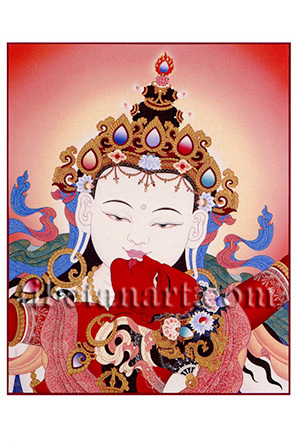 This painting shows the face of Vajrasattva (Tib. Dorje Sempa) as he appears in sexual union with his red consort, Vajragarvi (Tib. Dorje Nyema). Vajrasattva, the 'adamantine being', is peaceful and white in colour, with a sweetly smiling face and two bow-shaped eyes. He wears the dive silk and jewel ornaments of a bodhisattva, and his golden crown is adorned with five coloured jewels that represent the Five Buddhas of the five directions with white Vairocana occupying the central position. Half of his long black hair hangs freely about his shoulders, while the other half is piled-up into two topknots and crowned with a fiery blue gem. Vajragarvi, his red consort is adorned with a five-jewel tiara, gold and bone ornaments, with a bone wheel of eight spokes and a half-vajra crowning her topknot. She has two eyes, and with her raised right and left hands (not shown) she holds a curved knife and a skull-cup.